I’ve got a mad love-affair with grain bowls and I hope it never stops. These are the meals I eat most of the time; the ones that never make their way to Instagram, this space, or even to the dining room table. Most of the time, my meals are a throw-together of ingredients that I’ve prepped in the fridge: roasted vegetables, cooked grains, some type of protein and every bit of condiment or sauce I can get my hands on. They usually aren’t pretty, but they are pretty tasty. I’ve been eating this way since I was a kid. Back then, I would swirl all of the food on my plate and call it “ma-da pasta!” and be weird. Other kids couldn’t handle their items touching, I wanted mine mashed together and topped with extra sauce. I suppose it’s no wonder I eat the same way now, well into my thirties. Since bowls have become a pronounced thing, I’ve tried to get more creative and themed with my options. As tacos have become dinner choice #1 as of late, this is my deconstructed version of a favorite meal. Please try it. I know tempeh is weird and sometimes gross if not made correctly, but it can be life-changing when cooked well. This version is lightly fried and perfectly spiced. I’ll make a batch of this to top on this taco bowl, in actual tacos and to sprinkle on my egg and avocado toast sandwiches. It’s golden, crunchy and addictive. The black bean and corn salsa is just as delicious here as on it’s own with lots of tortilla chips. Nothing too fancy, but homemade salsa > store-bought salsa. I know it’s a few extra steps, but it’s well worth the prep time. And, just like the tempeh, can be used in plenty of dishes throughout the week. Are we sensing a theme here? Bowl meals are the gift that keeps on giving. 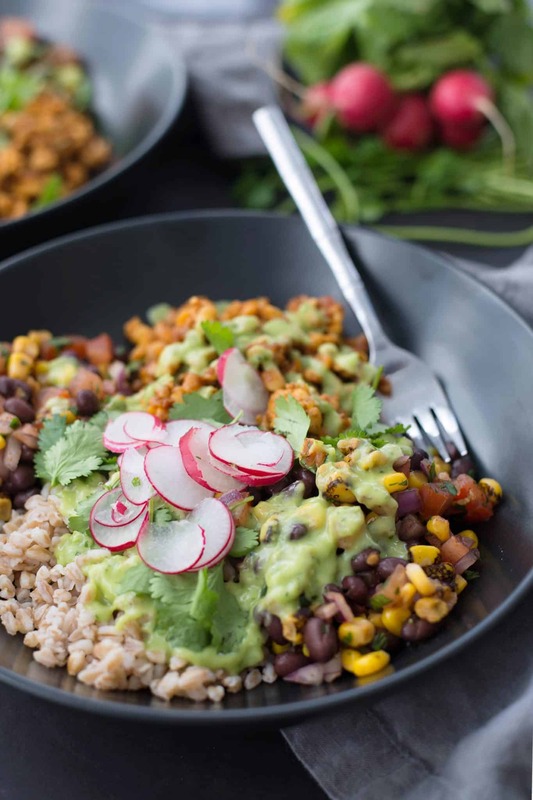 Make the ingredients and try them this way first, then swap out the farro for lettuce the following night for taco salad, then use the separate ingredients wherever makes sense. Cook once, eat a dozen times. 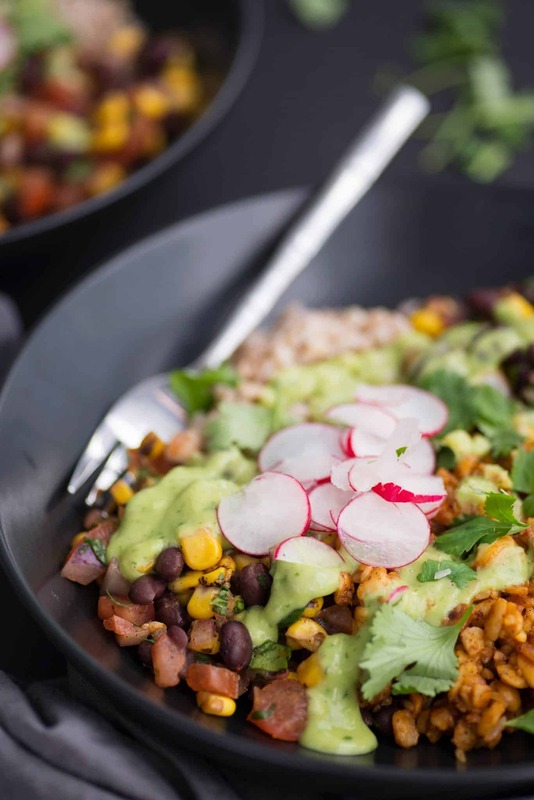 Vegan Tempeh Taco Bowl! These bowls are a MUST-MAKE. 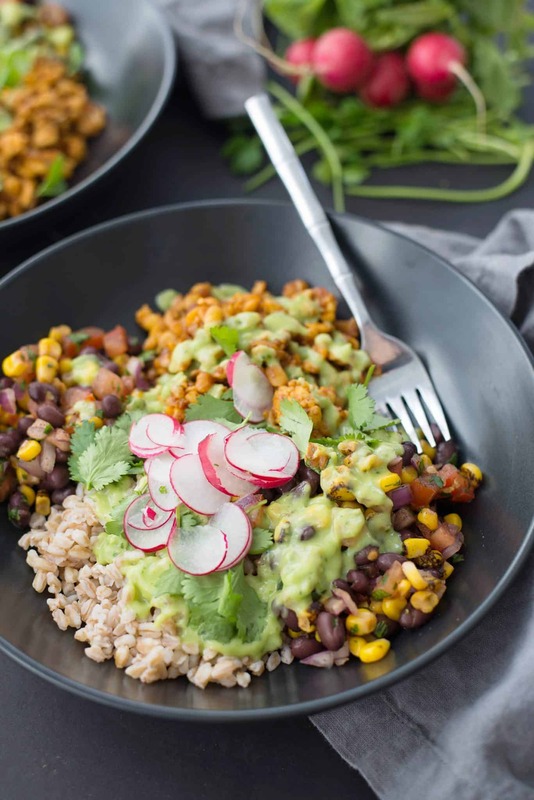 Spicy tempeh taco filling, farro, black bean and corn salsa, pickled radishes and a creamy avocado-jalapeno sauce. Combine farro and water in a pot, then bring to a boil. Reduce heat to low, cover and simmer for up to 30 minutes or until farro grains are tender. 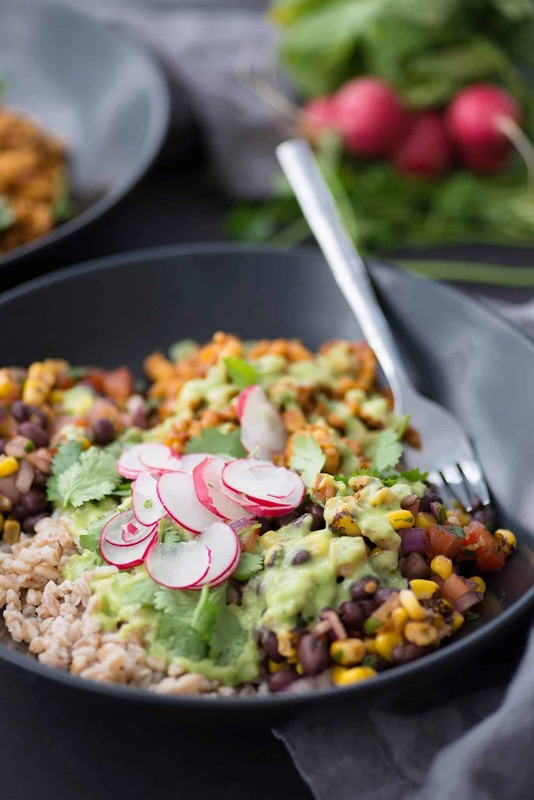 While farro is cooking, mix together corn, black beans, tomato, chopped cilantro, and juice from the lime. Season with salt, ¼ teaspoon of chili powder, and ¼ teaspoon of paprika. Set aside. Heat oil in pan over medium heat. Once oil is hot, add minced garlic, stirring frequently to ensure it doesn’t burn. Once garlic is fragrant and has some color, add tempeh. Use a wooden spoon to break tempeh into small pieces. Season tempeh with the remaining chili powder and smoked paprika, cayenne, and salt. Continue to cook tempeh until soft, about 10 minutes. 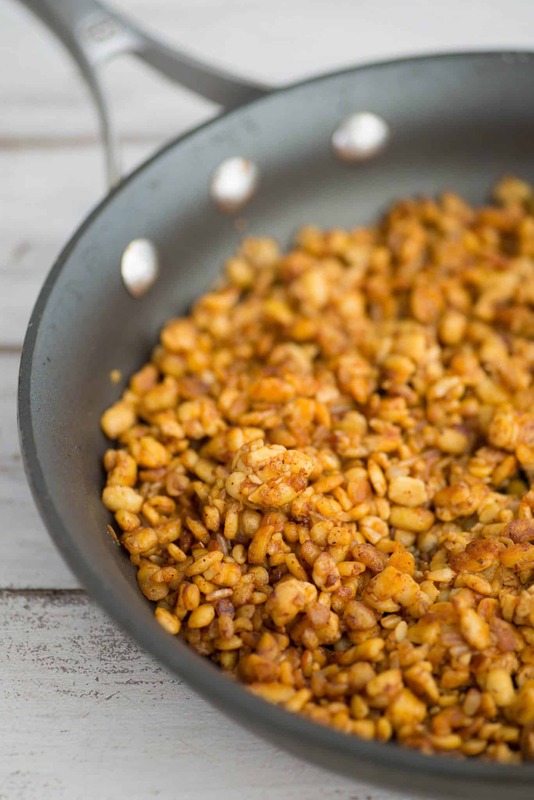 A couple of tablespoons of water can be added to keep tempeh from drying out. 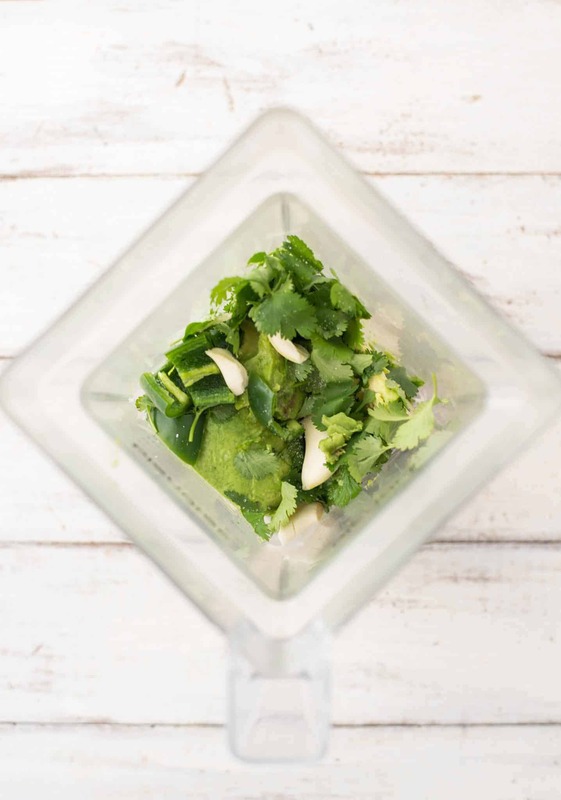 While tempeh is cooking, combine ingredients for green sauce, except water, in blender. 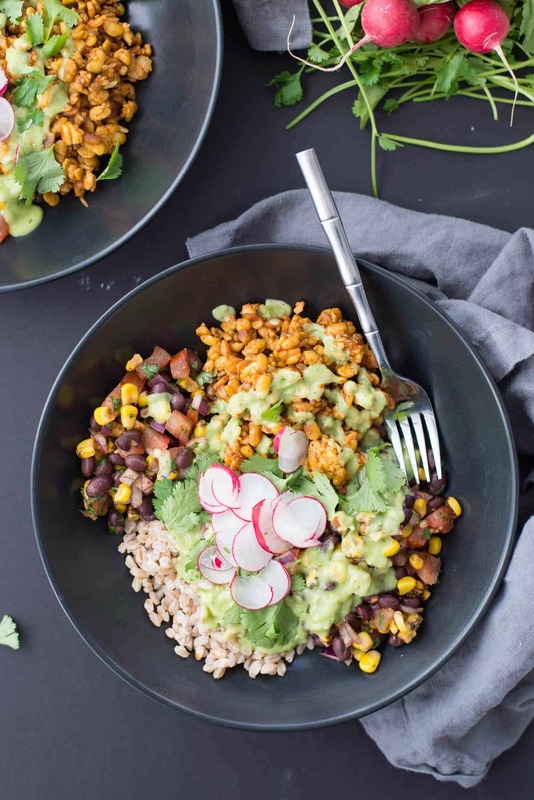 Once farro and tempeh are cooked completely, combine with black bean salsa, and divide among 4 bowls. Top with green sauce, radishes and serve. I’m pretty much obsessed with all bowls as well. 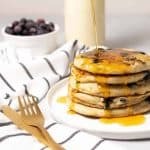 These look so fantastic!! 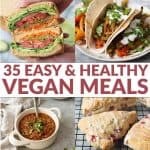 I need to add them to my dinner rotation! Thanks Tara! They are so easy to assemble, I love them! Amazing. I had been making bowls, but not with a sauce like this. Added it to a few things now, delicious! SO glad you liked it! Thanks for the comment.